Connecting Southport and Wigan Piers, the 34km (21 miles) Pier to Pier route has been developed by VISIT Sefton and West Lancashire and Wigan Council. Southport Pier is a recognisable landmark and is a Grade II listed Pier, the oldest iron pier and at 1,216 yards (1112m) the second longest in the country. The original pier was officially opened up to the public in 1860 and was an instant success. The pier is now a completely open structure, with modern railings and a deck made of hardwood slats that give a partial view of the sea below. The modern structure at the pier head, the Pavilion, houses a cafeteria with airport style floor to ceiling windows overlooking the beach and is a wonderful place to sit and enjoy the panoramic views. Wigan Pier is not the sort of pier associated with those of a seaside resort. It’s actually inland by the Leeds to Liverpool Canal and was typical of the type of "pier" built alongside rivers and canals in the 18th and 19th centuries. The original ‘pier’ at Wigan was a coal loading staithe, where wagons from a nearby colliery would unload into the barges. It was built in 1822 and about 1000 tons of coal was transported from here each week. Today the name Wigan Pier refers to the area around the canal at the bottom of the Wigan flight of locks on the canal. The nearby Trencherfield Mill was a cotton mill built in 1907, it has now been transformed into apartments, however, the ground floor still houses the world's largest working steam engine and is open to the public on Sundays. 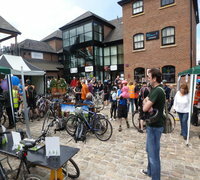 The route was officially opened on Sunday 16th June, 2013 when an organised ride of the route was held followed by a family fun day at Burscough Wharf. Cycle HIre is available at the Eco Centre, Esplanade, Southport.